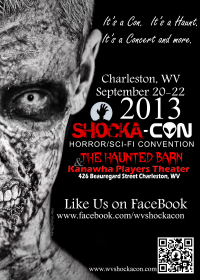 We are one week away from Charleston’s Horror and Science Fiction convention, ShockaCon. It kicks off one week from today at The Haunted Barn and Kanawha Players Theater on Beauregard Street on Charleston’s Historic East End. You can find details on how to buy tickets at the ShockaCon website. The very-cool “It’s A Horrorful Life” blog has posted preview articles spotlighting some of the guests, like Eamon Hardiman, Danny Hicks and R.J. Haddy. We will have more on ShockaCon next week. Saturday night at The Empty Glass it’s a night of great instrumental music as French band, Mörglbl and Neil Zaza featuring Sean O’Bryan Smith take the stage at 10 PM. We told you al about it a few days ago, but now we’re going to bring you an extra treat. Neil and Sean played together for the first time last June at Dave and Lisa Roberts house in South Charleston. Here is a newly-cut video of the guys tearing into Sean’s hit, “Tapestry” with a little bonus virtuoso pyotechnics added at the end. Sunday Dr. Sketchy’s returns to Uncork and Create for an evening of art with with Qiet. The amazing undescribable band will both model and perform. The night starts at 6 PM. Admission is ten bucks. You can get two dollars off of that by ordering your ticket online. 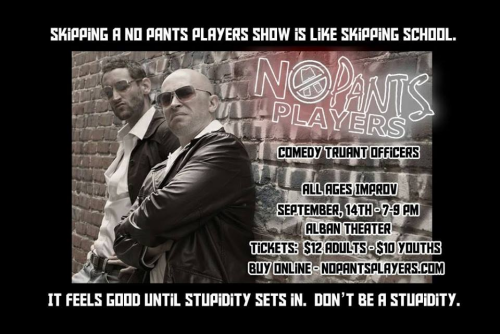 The No Pants Players return to The Alban Arts Center for a family-friendly show Saturday night. That’s about it for this week’s PopCulteer. Remember, PopCult now has new content at least once a day. Tomorrow we will bring back a “lost” episode of Radio Free Charleston. Monday will see our newest full-length show, with The Renfields, The Dread Crew of Oddwood, Decomposing in Paris and Snakebox. And much of the week will set the tone for ShockaCon. So don’t miss it.